Check out our video gallery. 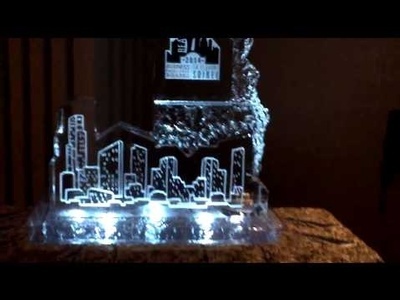 Contact our Ice Sculptor in London, Ontario at Festive Ice Sculptures to know more. 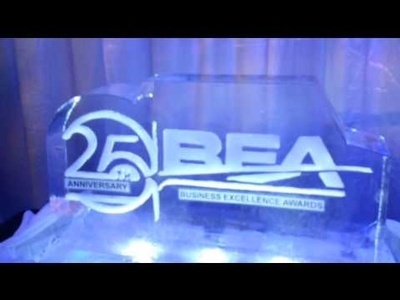 Amazing ice sculpture prepared at Windsor casino, Ontario for the Windsor chamber of commerce on occasion of excellence award ceremony. It is created by rick the ice guy from festiveice ice sculpture company. 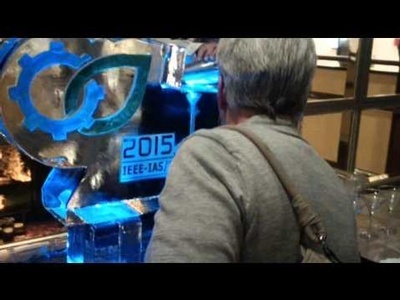 In this video you can see the 5 bottle chiller display ice sculpture at crown plaza hotel's re grand opening at Kitchener, Ontario, Canada with full entertainment from bottle flippers, spinners from the idea hunters company guys. 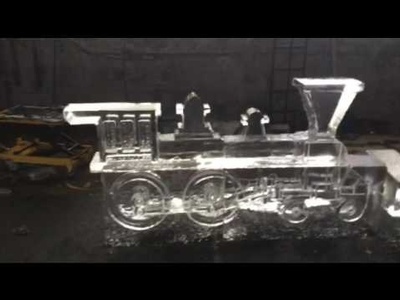 It is created by rick the ice guy from festiveice ice sculpture company. This design was created for a very HIGH end function which was located at the HAMILTON ART GALLERY in Ontario. Champagne and Diamonds were the theme of this function. So I created a Diamond LUGE. 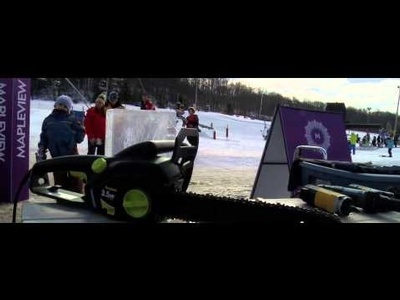 As seen in the video this design is an awesome centre piece which also has total functionality as a luge. It was used to serve champagne right through the centre of the diamond. An spectacular way to serve up drinks and an interactive way to involve your guests to receive their beverage. This design was created by RICK the ice guy and Festive Ice Sculptures. 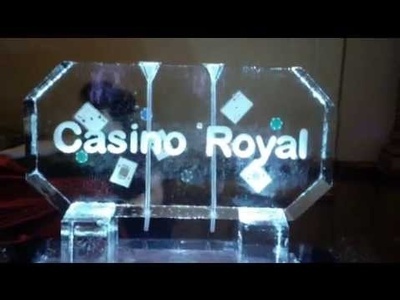 In this video you can see a casino royal theme luge ice sculpture created at Chicharo club, Windsor, Ontario for the Luvinova high school prom. It is created by rick the ice guy from Festiveice ice sculpture company. 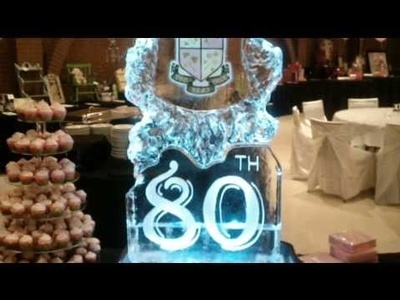 In this video you can see about 5 feet tall and 200 pounds heavy beautiful and a creative ice sculpture created at the 80th anniversary function at may court club Chatham. It is created by rick the ice guy from Festiveice ice sculpture company. 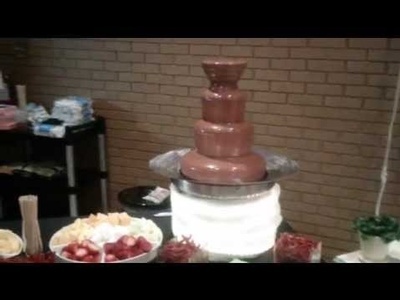 Here you can see the chocolate fountain with Belgian chocolate for the full function of 4 hours to serve the guest with various dipping. It is created by rick the ice guy from Festiveice ice sculpture company. A functional luge with the pca cement conference logo made at city centre down town to serve about 350 people though that design. 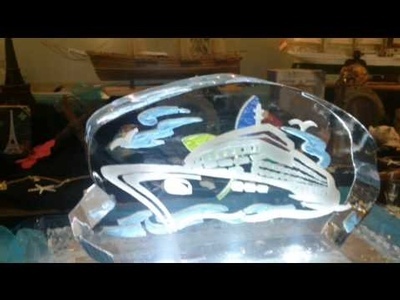 It is created by rick the ice guy from Festiveice ice sculpture company. 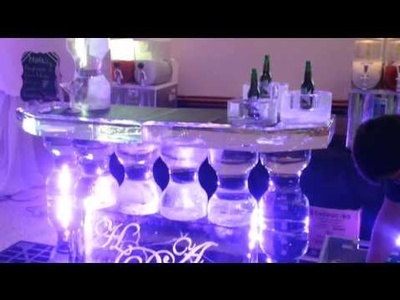 In this video you can see hosts are very happy with a huge 5 feet ice bar created to serve drinks to guests at a wedding at Lebanese club, Leamington, Ontario with a cooler luge. It is created by rick the ice guy from Festiveice ice sculpture company. 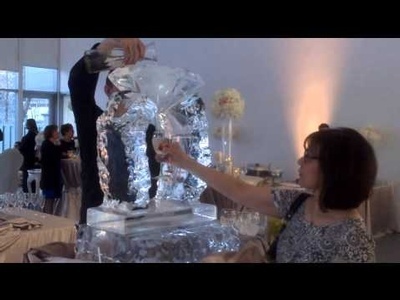 Here in this video you can see an artistic heart design martini luge with initials of the bride and groom in heart at a marriage function at Windsor, Canada. The base on this martini luge is given the solid rock effects. It is created by rick the ice guy from Festiveice ice sculpture company. 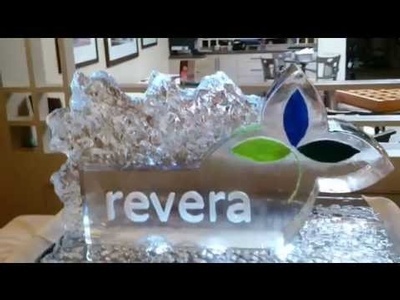 Here you can see a ice sculpture logo created at horizon Revera, London, Ontario, Canada. Nice rock effects are given to a 3 feet long and 2 feet tall ice bar sculpture. It is created by rick the ice guy from Festiveice ice sculpture company. 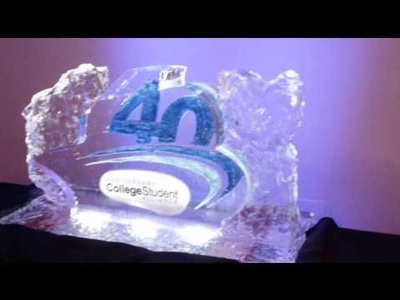 In this video you can see a big centrepiece 2 feet height and 3 feet long and from 220 pounds of ice created by the Festiveice at a 40th anniversary function of college student alliance Windsor, Ontario, Canada. It is created by rick the ice guy from Festiveice ice sculpture company. 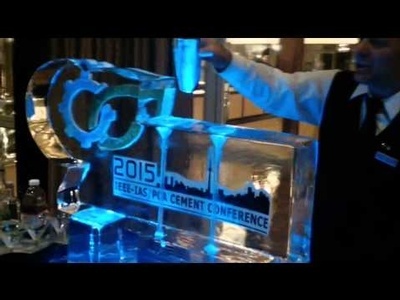 Colourful corporate logo centrepiece made at a cement conference in Toronto, Ontario from crystal clear ice with beautiful art work at dinner function. It is created by rick the ice guy from Festiveice ice sculpture company. 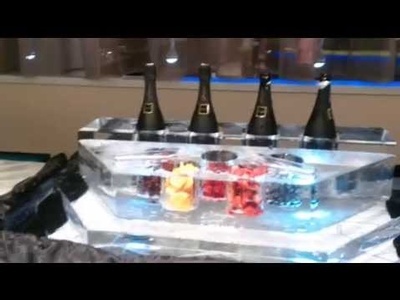 In this video you can see champagne station ice sculpture made by Festiveice at crown plaza hotel's re grand opening at Kitchener, Ontario, Canada. 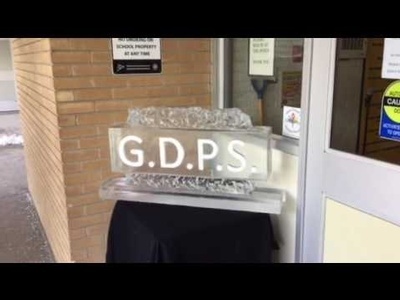 It is created by rick the ice guy from Festiveice ice sculpture company. 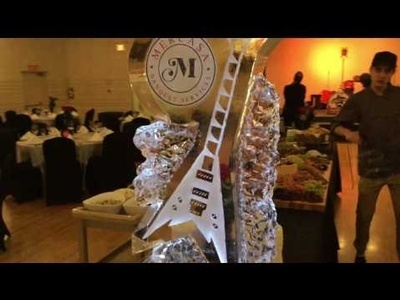 Here you can see the clam-shell design ice sculpture created by Festiveice ice sculpture at a wedding to serve food at club Italia, Niagara falls, Canada. With that a single path luge is also created to serve signature drink to guest. It is created by rick the ice guy from Festiveice ice sculpture company. 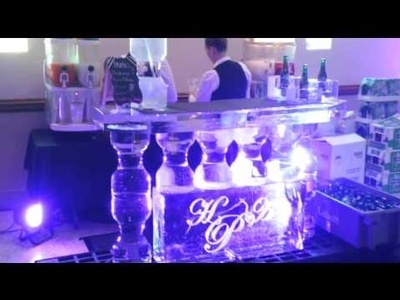 In this video you can see a 3 feet tall artistic drop path luge design created with the word "LOVE" inside to serve the signature drinks at a club near the lake Hamilton, Canada. It is created by rick the ice guy from Festiveice ice sculpture company. Awesome and cool luge created by the Festiveice ice sculpture at pca cement conference, city centre Toronto, Ontario to serve the guest. It is created by rick the ice guy from Festiveice ice sculpture company. Pillar centre pieces. I created 25 pillar centre pieces and each pillar has a ORCHID frozen in the centre of the pillar. I created a rock effect around each pillar to give them that ice berg effect. Each pillar is approx. 15in tall and 9in square. They are displayed on centre piece stands with lighting from underneath. Also a black squirt around each base. I also created a full block design which is similar to the smaller centre pieces. The full block design is approx. 3.5 ft tall with an ice berg effect around the edges and this design also has orchids frozen in the centre and lettering and names to personalize the design. This design was created by RICK the ice guy and function location was at the COBOTO CLUB in WINDSOR ONTARIO. 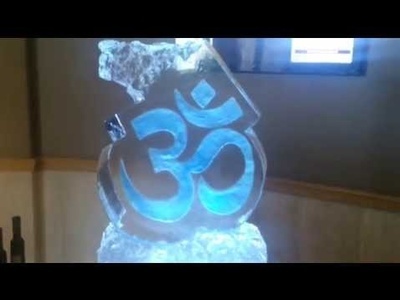 In this video you can see a 3 feet tall aum symbol ice sculpture at the Chicharo club Windsor Ontario Canada created by the Festiveice ice sculpture. It is created by rick the ice guy from Festiveice ice sculpture company. Excellent cruise shape ice sculpture with corporate logo made form the crystal clear ice at a corporate event at Niagara falls. It is created by rick the ice guy from Festiveice ice sculpture company. 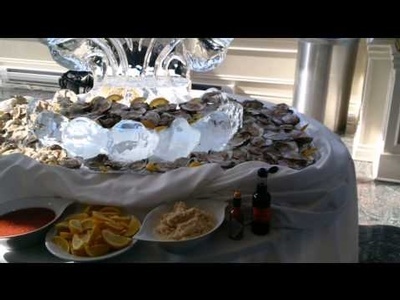 This video was created at the WINDSOR CEASARS CASINO in WINDSOR ONTARIO. The function was held in the Augustus salon which hosted approx. 800 guests this function was held by the WINDSOR / ESSEX Chamber of Commerce. Their theme and decorating incorporated a city scape theme throughout the room. So I incorporated a city scape design into the lower main part of their sculpture. I then added their LOGO for this function which can be seen on the top right. I was set up just outside the door entrance to the hall for all guests to view as entering the function. This design was created by RICH the ice guy and Festive ice sculptures. 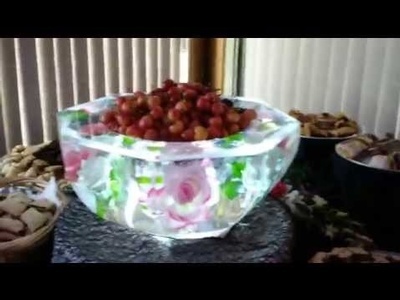 In this video you can see an elegant floral ice sculpture of the octagon shape bowl to serve the cherries with the sweets and pastries at a marriage function at Windsor, Ontario, Canada . It is created by rick the ice guy from Festiveice ice sculpture company. 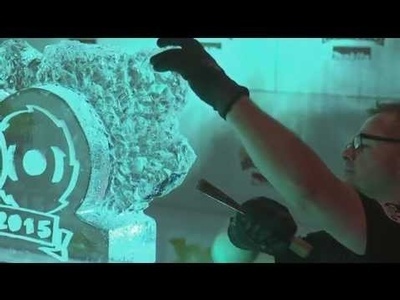 Here in this video you can see Rick the Ice guy from festiveice.com trimming and giving rock effects to a crystal clear ice sculpture made at Canada. 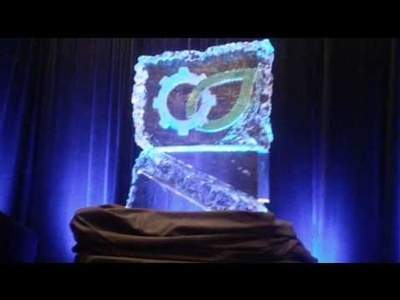 A Wow ice sculpture created by rick for the event. 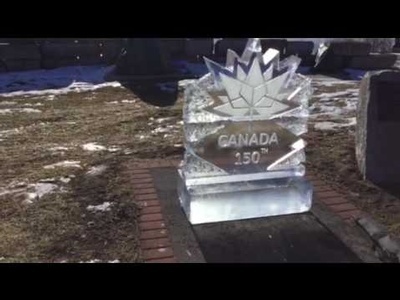 Awesome ice sculpture created by rick the ice guy for the event Canada 150th. The fantastic Train Engine created for the event By rick. 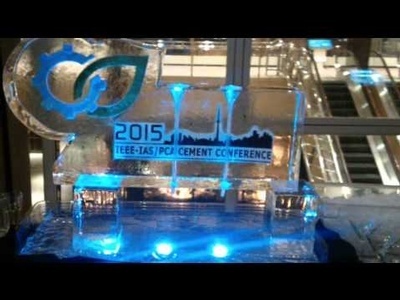 Here you can see the functionality of the luge created by the Festiveice ice sculpture at pca cement conference, city center Toronto, Ontario. 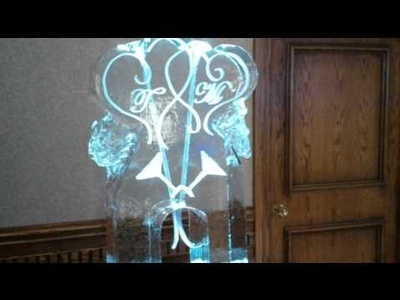 It is created by rick the ice guy from Festiveice ice sculpture company. 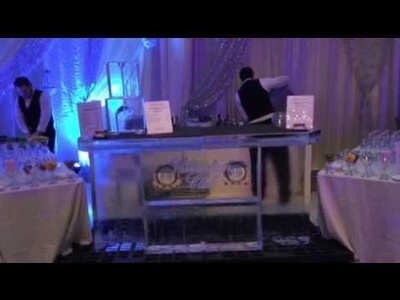 In this video you can see a huge 5 feet ice bar created to serve drinks to guests at a wedding at Lebanese club, Leamington, Ontario with a cooler luge to serve drinks to guest. In fact you can see that it was a big attraction at that event. The bride herself came to watch it. It is created by rick the ice guy from Festiveice ice sculpture company. 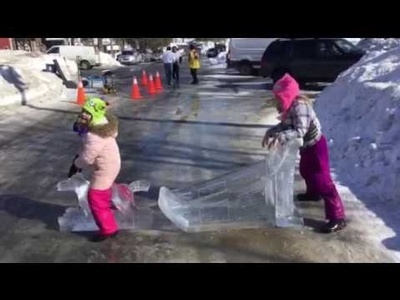 Here in this video you can see Rick the Ice guy from festiveice.com trimming and giving rock effects to a crystal clear ice sculpture made at Ontario, Canada. This video was created at a Live Carving demo at the Glen Eden / Kelso SKI CLUB located in the MILTON area just outside of TORONTO ONTARIO. This function was hosted by the Mapleview Mall who acquired the ski hill for the day. Part of the festivities was the Live carving demo which happened on SUNDAY. As you can see in the video I created a PURSE Sculpture which I carved at my studio and delivered to the ski hill on Saturday. Sunday morning I returned with approx. 200 brick sized building blocks. A building block station was created near the kiddie ski slope for kids to use their imagination to create and build with these blocks. It was a hit and a lot of fun. Once the building block station was set up I moved to my demo carving location which was located at the bottom of the ski hill. I carved for approx. 3 hours working on a STELLETO design. During this time I carved, mingled and answered questions regarding carving ice and the proposed design. Fun was had by all and “YES”, that’s me. RICH the ice guy from Festive Ice Sculptures ”CHILL” for now RICH. 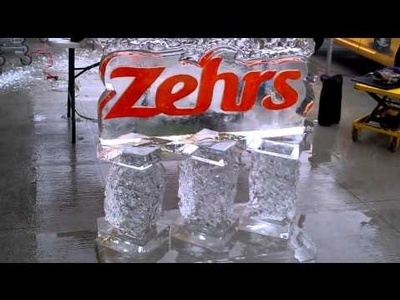 This video is of the Zehrs logo created at GUELPH. It shows the shaping of the main logo design. I have taken the rectangular block and shaped the outside of this block to give it shape and perspective. Giving it shape adds to the display and look of the design instead of just a square block, which is kind of boring. I will add pillars as a base to give the design height and a cool rock effect look. RICH the ice guy. 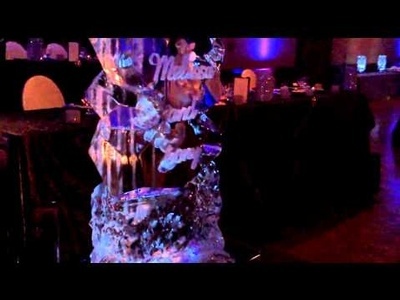 Here in this video you can see Rich the Ice guy from festiveice.com making an ice sculpture logo from crystal clear ice at MAKITA'S 100th Anniversary celebration. This tall, big and wide ice sculpture has 100 scarved in it with perfect rock effects around and Rich is giving it the final shape to it. 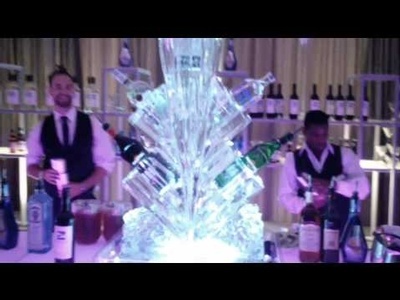 Here in this video you can see Rick the Ice guy from festiveice.com making an ice sculpture logo from crystal clear ice at Canadian Club. This tall, big and wide ice sculpture has 100 scarved in it with perfect rock effects around and Rich is giving the final shape to it. 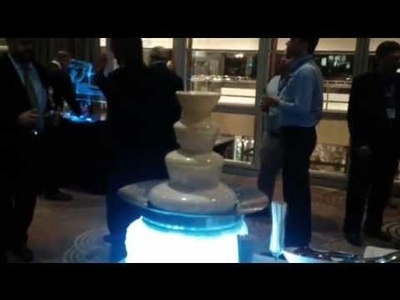 The sweet and beautiful chocolate fountain for a party at pca cement conference, city center Toronto, Ontario. It is created by rick the ice guy from Festiveice ice sculpture company. This videos was created at a LIVE CARVING function for a ZEHRS GRAND OPENING in GUELPH ONTARIO. 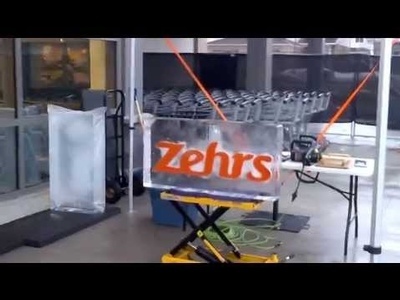 The video shows the block which has the lettering ZEHRS created within the block. This block is approx. 40in long, 20in tall and 10in thick. 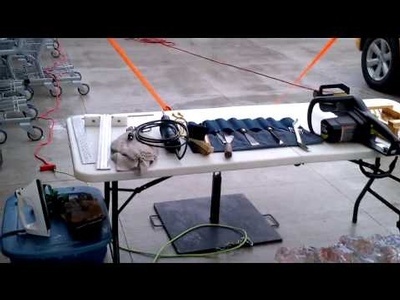 This video just gives you the perspective of the design before a chain saw has been used to manipulate its shape. As you can see the weather is also on the mild side. This design will be carved and shaped by RICH the ice guy from Festive Ice Sculptures. Other videos will show stages of completion of this design to its final finished display ”CHILL” for now RICH….. 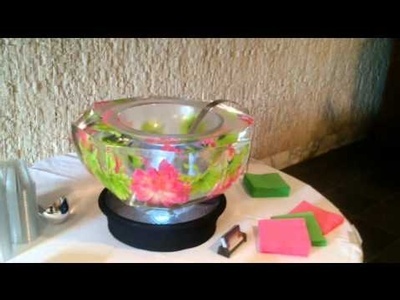 Here in this video you can see the beautiful ice bowl created with frozen flowers inside matching the logo and the theme design. 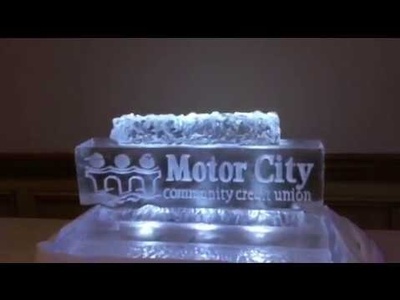 It is created by rick the ice guy from Festiveice ice sculpture company. This ZEHERS logo was created for a Zehers GRAND OPENING. It was a live carving demo which lasted approx. 3 hours. This is the finished design which shows the colored logo shaped around the edges. I created 3 pillars for the base on sight and a flat slap which is located underneath the pillars. As you can see this was a wet rainy day but the design held up with flying colors. This design gives you an idea of what is possible even in not so complimentary weather conditions. This design was created by RICH the ice guy and Festive ice sculptures ”CHILL” for now RICH.